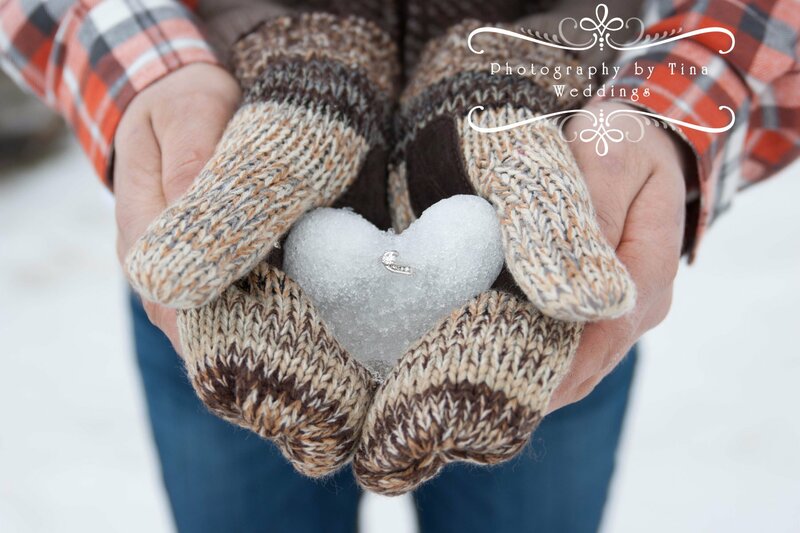 Summer months are the most popular months for weddings, but there really is something special about a winter wedding. This past winter I was blessed and honored to photograph the wedding of an amazing young couple ... Allisen (Montana) and Kyle Franck. Winter in Wisconsin had a late start, and we had to actually seek out picturesque places with snow on the ground, but the couple knew of the perfect spot ... not far from the church where they were getting married and along the river where the ice was forming and snow had collected on the banks. Between the path leading to the river and the images by the river itself, it was an amazing photo opp for their romantic wedding images! But the most amazing part of photographing this couple's wedding, for me, was their obvious and sincere love for each other ... and for Christ. While being married in a church with a beautiful wedding dress that suggested a "traditional" church wedding, this couple stepped out of the box right from the very beginning. They opted not to have attendants ... i.e., bridesmaids and groomsmen ... for their wedding, and instead, to focus their ceremony on the bond they would share with Christ as they become one with Him in marriage. During their worship service, which was every bit that as well as a wedding ceremony, the couple freely sang along with the worship songs, eyes lifted heavenward, along with the entire assembly. The minister spoke of Christ's love, this love that they should emulate in their marriage. And he read letters written by the couple's parents to them on this blessed occasion. It truly was a beautiful thing to behold. There were tears in many eyes, mine included. Everything was held at Highland Community Church at the Weston Campus. No dance was planned, but with Christian music in the background, apparently many of the female family members and friends of the bride had a little something up their sleeves. The bride helps lead a Christian dance exercise class, and at the end of the dinner, one of the songs from the class suddenly began to play and the volume to rise. It was a good thing I had my camera in my hands, because I turned to see the bride sashaying up the aisle between the tables toward a group of women from her class gathered in an open space, already dancing to the song just as she had taught them in class. It was a wonderful uplifting sight to behold, and the music and spirit was positively contagious! Some of the images captured during that single dance are among my favorites from that day! From the first look in front of a Christmas tree to the unusual menu items lovingly prepared by family and church members ... all healthy, guilt-free, and delicious I might add ... to the gorgeous decor, a combination of wedding and Christmas beautifully combined ... to the Christian music in the background, this wedding will always stand out to me. Whether this couple knows it or not, they raised the bar by deviating from "traditional" twenty-first century wedding customs and creating a ceremony and celebration that was entirely about family, faith, and the beginning of a married life together that truly puts both of those things first. The wedding wrapped up early in the evening with a bubble blowing sendoff and the couple driving away in the car their friends had decorated. Shorter, perhaps, than many weddings I have photographed. But infinitely memorable. I hope all of you enjoy peeking at some of the pages from this couple's beautiful wedding album, including an image of them holding the album in their hands and seeing it for the first time. All of these images really help tell the story of their love on their beautiful and blessed winter wedding day. Blessings to you both, Mr. and Mrs. Kyle and Allisen Franck! Planning to Propose to the Love of Your Life? Document that Once-in-a-Lifetime Moment in Professional Images! If you’re stuck for creative ideas about how or where you can propose to make this once-in-a-lifetime magical moment absolutely perfect for the love of your life, I can even help you plan the perfect proposal! You might not think proposal photography is important, but girls want secret proposal photography almost as much as they want the ring. (Well, maybe not quite that much, but a lot.) This is one of the most important moments of your soon-to-be-wife’s life, and all of her friends and family are going to be ask how it happened. What better way to share that moment with them than with amazing, professional photos? I’m telling you, your soon-to-be-wife will be bragging about you for years to come! You can purchase this service a la carte, or we can add it on to your engagement or wedding package. 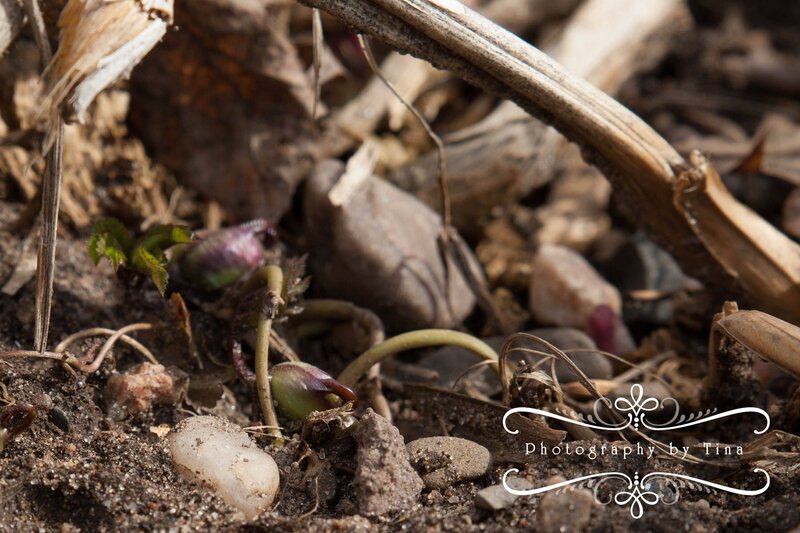 For pricing and booking information or to learn more, email me at tina@photographybytina.com or call me at 715.212.0767. For Christians the world over, the meaning of Easter is clear: It is the very foundation of our faith, the celebration of the Resurrection of our Savior, Jesus Christ. It is our hope. Our assurance. The very reason we are Christians. 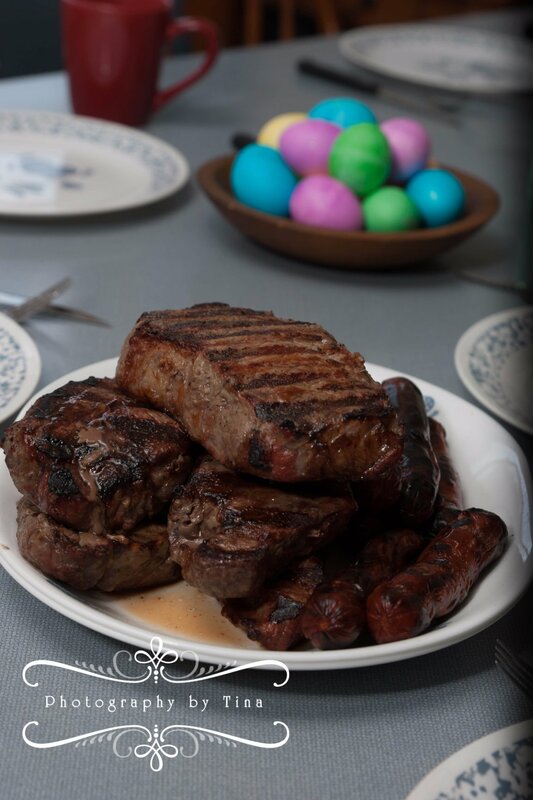 But hundreds of years ago, the Easter holiday also took on some secular traditions: like dying or decorating eggs, baskets of treats and goodies on Easter morning, and the like. In our family, we celebrate the true meaning of Easter, and Easter Sunday would not be complete without the beauty, tradition, and meaning of going to mass. But we also celebrate fun traditions like coloring eggs, Easter egg hunts, the Easter bunny coming, Easter baskets full of goodies for the littles ones, and a big meal with loved ones ... so Easter means all of that to me, too. 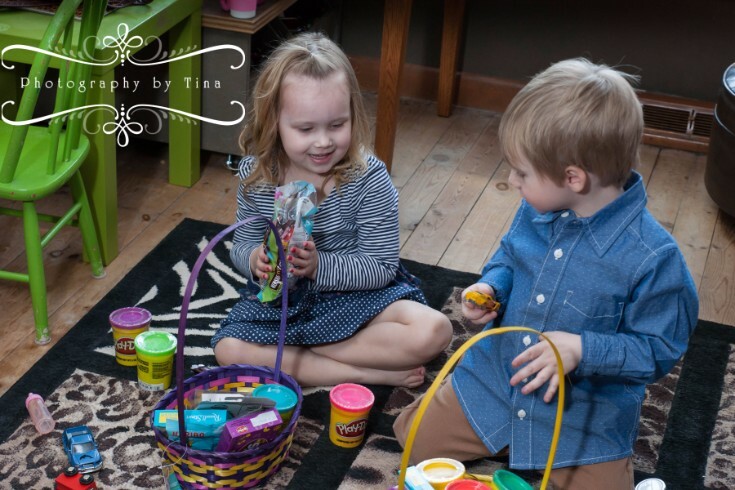 This blog includes images that depict some of those latter things ... little ones loving their Easter baskets and a delicious Easter dinner at one of our Easter celebrations. 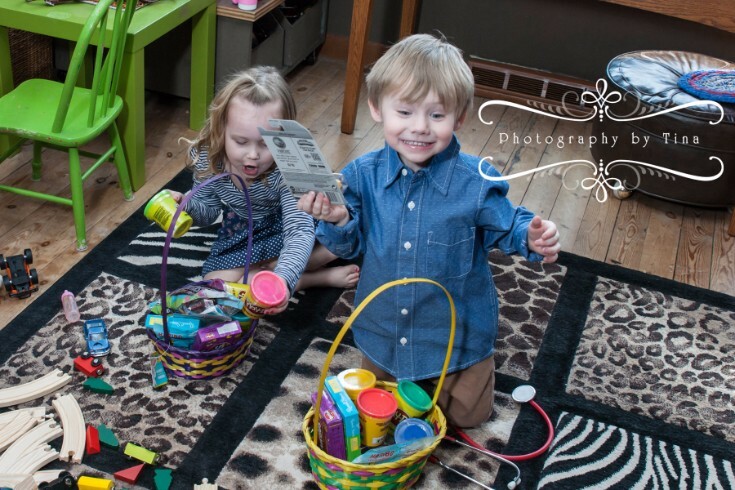 There is absolutely no doubt that the look of delight on a very special little boy's face as he discovers a new matchbox car and a small four wheeler in his Easter basket captured a magical moment for all of us. And just as adorable the delight of a certain little girl at the discovery of Chocolate! in hers! 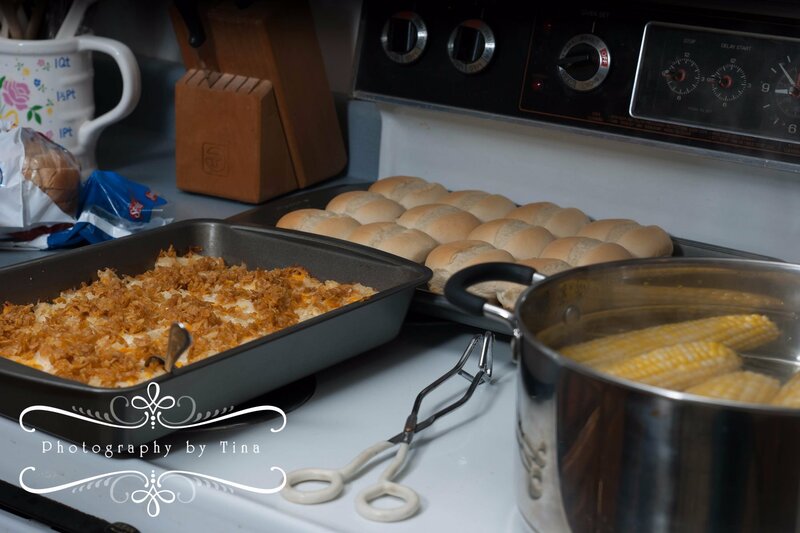 Cheesy potatoes, fresh-baked rolls, corn on the cob, and steaks hot off the grill can make your mouth water! 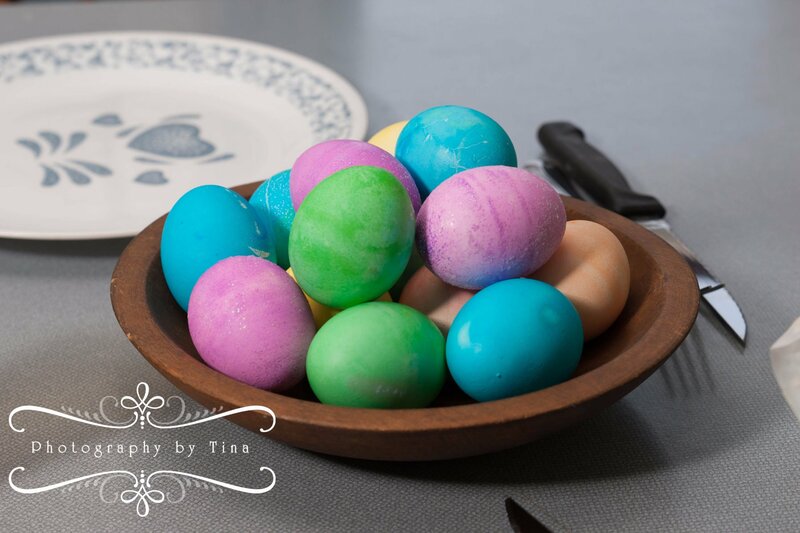 Colored eggs in an antique wooden bowl make a beautiful centerpiece. 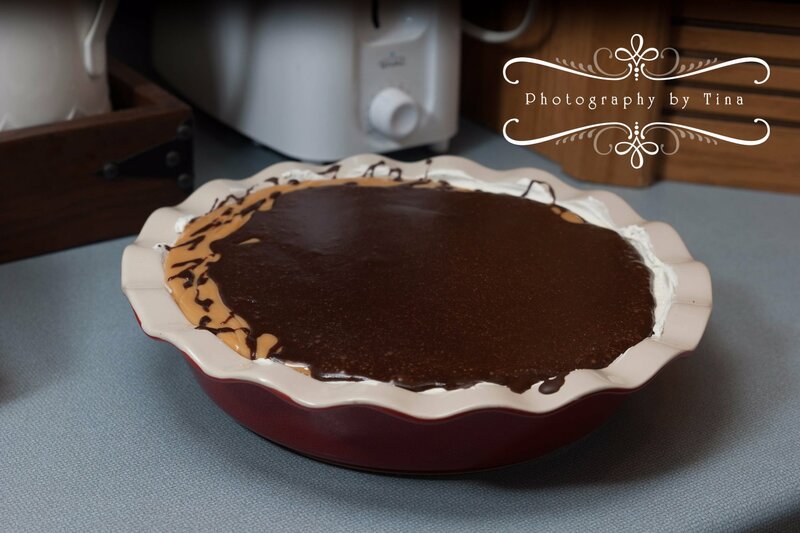 And homemade cheesecake in a trendy pie plate is enticing to say the least. But as I experienced Easter Sunday mass this year, the photographer in me really, really wished I had had my camera in hand and could have been discretely capturing some of the images that just spoke to me and would have really depicted the true meaning of Easter here for me. It wouldn't have been appropriate, of course. But these are the images I really wanted to include in this blog. If I could have created those images with my camera, this is what they would have looked like. A picture really is worth a thousand words, so these descriptions won't compare to the images I could have created with my camera, but follow along with me to see if you can envision these images in your mind's eye. How I wish I could have created them for you to see here! The first image I wanted to create would feature the red eternal light of Christ candle in the foreground, its light flickering, with the gold and ivory crucifix on a stand in the background. In between stands the stately and shining brass tabernacle where the consecrated bread/the body of Jesus is kept between masses, flanked on either side by candleabras holding five burning candles each with pink potted azaleas before them, ivory and gold altar cloths beneath them. It is a holy vision. Appealing both visually and spiritually. But the focal point of this image is above the altar, in the outstretched arms of the two men. The deacon is on the left, his arm and eyes stretched upward, holding a brass chalice of wine. The priest on the right holds in his two hands a large host, broken in half and held so it is overlapping, arms stretched heavenward, eyes focused on the bread with an intensity of faith and belief ... In this image I wanted to create, the vision would be so alive you could almost hear the priest's words as he speaks the doxology: Through Him, With Him, and In Him ... in the unity of the Holy Spirit ... all glory and honor is yours, Almighty Father, forever and ever. There are other images I would take during this beautiful service ... Of a congregation with many churchgoers outfitted in new Easter dresses and a few little girls in bonnets and gloves, little boys in suits and ties. ... Of a toddler reaching for the host ... Jesus ... as the woman who is holding him partakes of Holy Communion, and after all, who wouldn't reach for Jesus given the opportunity. Of the new father carrying his sleeping baby girl in his arms coming back from Communion, the sleeping little angel in pink obviously only weeks old. Of the toddler two pews ahead of us who keeps errupting into delightful giggles during the service and makes everyone around him smile. Of the priest and the deacon blessing the congregation with Holy water. Of the choir of school children singing songs celebrating the Resurrection. So many images I do not actually have, but hold only in my mind. These I would have created, had I had the chance. 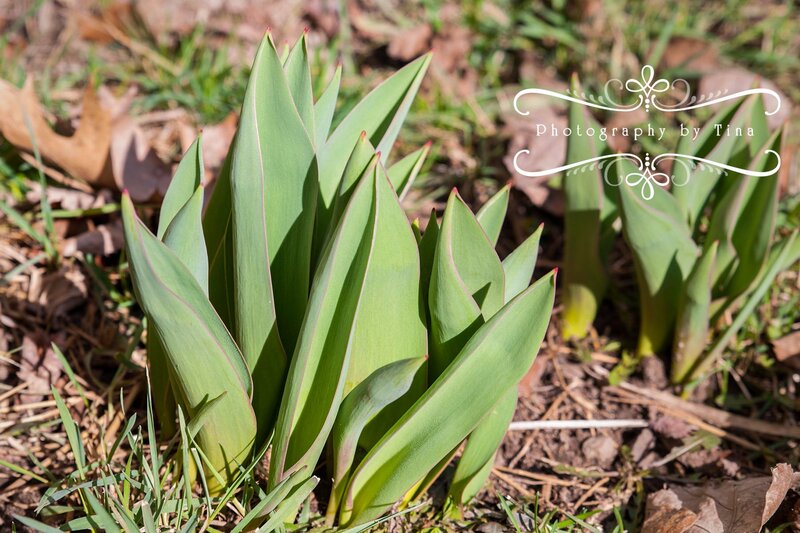 It's a funny thing to share in a photographer's blog, isn't it? Stories of the images I didn't get to capture, the photographs I didn't get to create. But such is the mind of a photographer and what often consumes me. For every beautiful image I create, there are dozens more I miss. But there is always the hope that one day I will have the opportunity to create those images. Hope. Really and truly, that is the meaning of Easter to me. That is the gift Jesus gave us when He rose from the dead. Hope. Eternal hope. I hope that you and your family had a blessed Easter Sunday, and I hope that you are filled with renewed hope in your life! It is, after all, the gift and meaning of Easter. I don't procrastinate on everything. But I do procrastinate on things that I feel like I should be doing versus what I currently want to be doing. Take right now, for instance. I'm supposed to be finishing my paperwork for my accountant to get my taxes done. If not that, then I have another pile of things on my desk that I should be doing. And the kitchen floor needs mopping. And there's laundry. And ... well, you get the idea. So what am I doing? Well, actually, I am watching HGTV and watching them remodel all these houses into amazing and beautiful well-organized masterpieces and bemoaning the fact that my house is kind of an unorganized disaster (yes, the studio, too). And I was simultaneously going through my email inbox and getting rid of some stuff (so essential, I know!). And while doing that I came across some info from a marketer I respect who emphasized how I need to be blogging at least once a week whether I want to or not and challenged me to do that. Every week. For 52 weeks out of the year. And I'm thinking, Yes, I really should be doing that. And I wonder how long I could do that before I slip up and skip a week and then it's months before I blog again? But since I am actually supposed to be doing something else, to write a blog write now sounds like more fun. So here I am. The marketing experts tell me I don't need to blog about photography sessions all of the time. That I can write other interesting things. But I never know what people want to actually read about. So what do I write about? And I like to include photos in my blog ... cause after all, I am a photographer, so isn't that the whole point? But sometimes I don't know what to photograph to go with a non-photography-related topic. So anyway ... this will be a work in progress. But just starting this first blog without any photographs made me realize I needed some photographs to go with it. And since I kind of love photography, I stopped typing, picked up my camera, and went out to shoot a few random things in my world in search of inspiration. 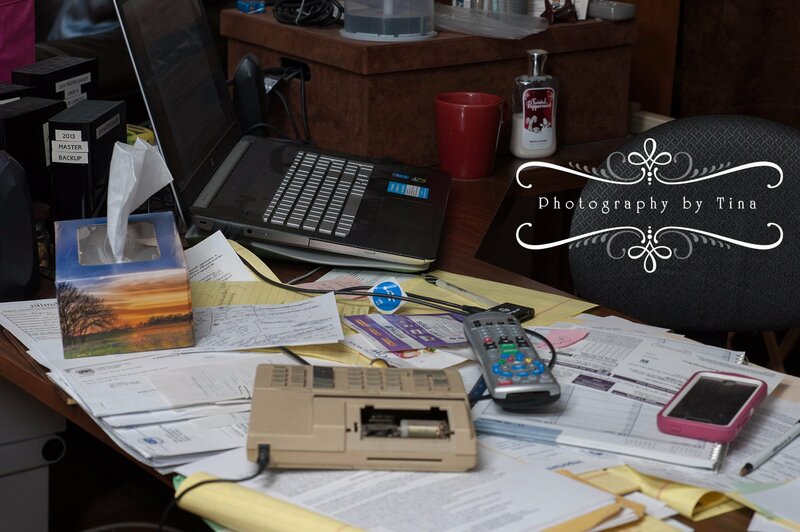 I photographed my chaotic desk: Great illustration for this post, don't you think? It kind of makes my point. 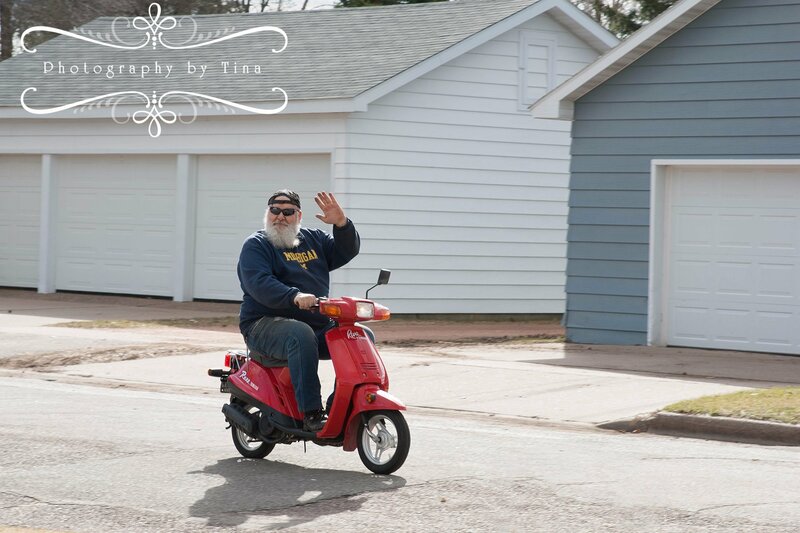 Then I noticed some friends of ours who live down the street zipping back and forth and around the block on their motorbikes and mopeds enjoying the gorgeous spring day, and I had my camera out at just the right time to get a great shot of one of our favorite neighbors, Steve, a/k/a "Papa Mahn" zipping by. I decided that was the winning shot for the day and it was a wrap. What is the moral of this blog? I don't think I really came up with one, but I did learn this. Procrastination isn't always a bad thing when it lends itself to having a moment of creative photography fun in the middle of what could have been a very boring afternoon preparing tax paperwork. And opportunities for cool images are all around us if we just open our eyes to see them. And finally, I can write a blog post even when I don't think I really have anything cool and exciting to share. So let's see if this can be the first blog post I write in a string of one each week, and let's hope I can follow through on my intent to do that for an entire year! Now back to working on my tax paperwork, I guess. Ugh! Mason Carpentier was just 2 years old when, in August 2014, he began showing signs of severe bone pain. It took a series of visits to several different doctors before his parents, Joe and Stephanie Carpentier, finally got some answers. 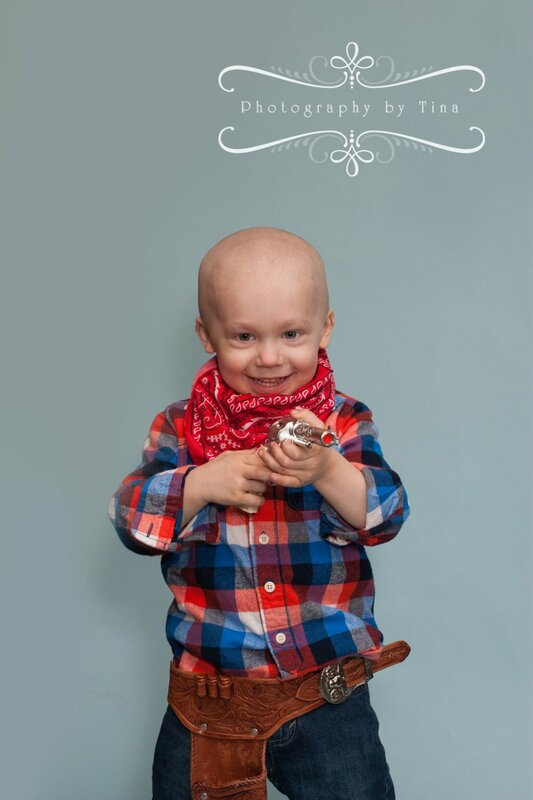 On October 9, 2014, Mason was diagnosed with stage 4 high risk neuroblastoma. Three tumors were discovered between Mason’s kidney and liver, in addition to cancer in his bone marrow. Thus began a whirlwind of appointments and procedures that hasn’t yet let up to this day. On January 28, 2015, the tumors were successfully removed without damage to any vital organs. Then it was back to Marshfield to continue with more chemotherapy. I do. I just figure out what will capture a child’s attention or illicit his or her interest. In this case, I decided to capitalize on one of Mason’s other interests. “How would you like to get your picture taken with a gun, like a real cowboy?” I asked him. Now that got his attention. 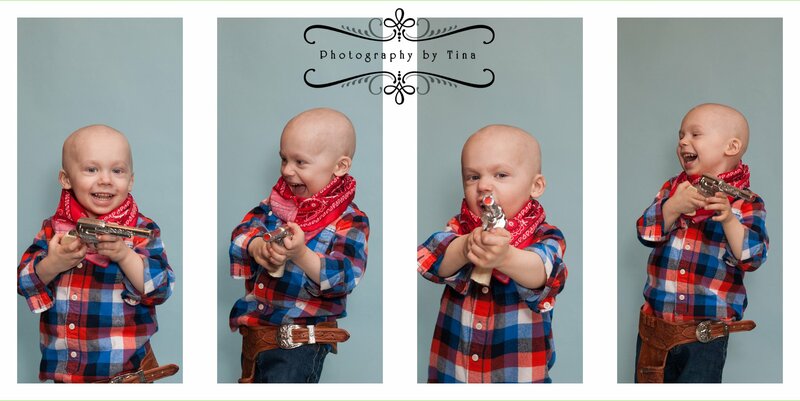 We switched locations in the studio, added a bandana, holster, and a cap gun, and then Mason couldn’t hold back the smiles! He also had, as you can see here in his images, a delightful variety of expressions that kept me and his parents in stitches. 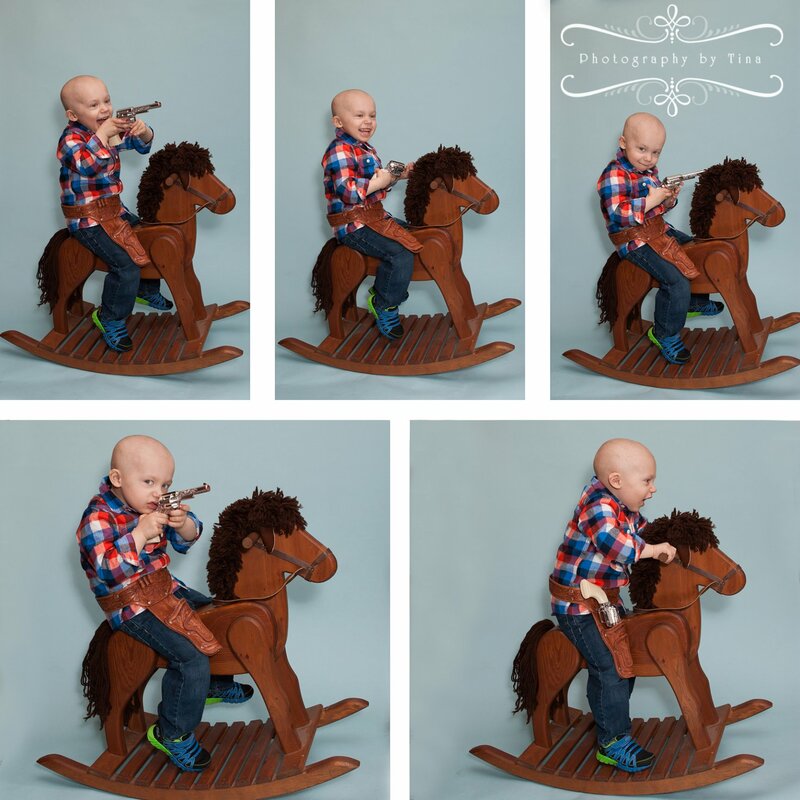 For the ultimate cowboy experience, I pulled in a rocking horse and encouraged, “Ride, cowboy, ride!” and “Shoot those bad guys!” It was an awesome experience seeing Mason come out of his shell for me! And I love the images we created for his family! Mason returned home and began radiation treatments in Marshfield. He had 14 days of radiation to his abdomen, for which he had to be sedated each time to keep him still. 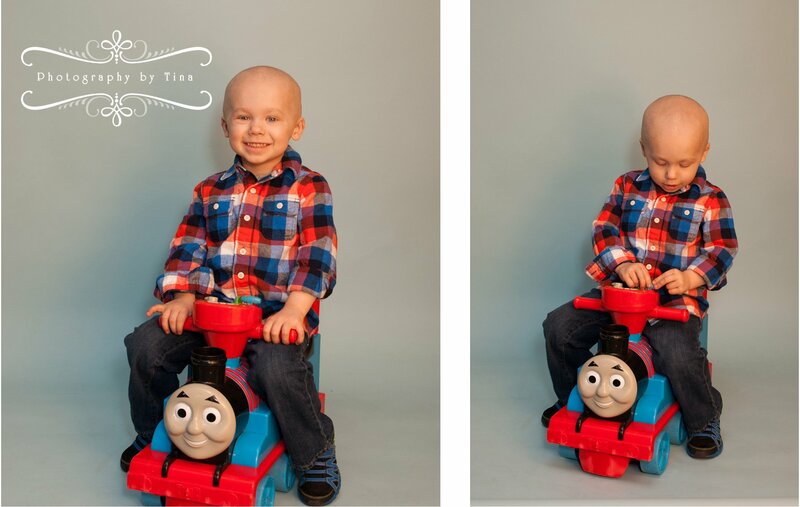 The week afterward was filled with tests and scans, and “All of the tests came back excellent and showing that Mason was neuroblastoma free,” Stephanie says. “The following 3 months consisted of immunotherapy. This is a mix of pills, injections, and intravenous medication to train his body to fight off cancer cells,” she explains. Mason was hospitalized 5 weeks on and off for this. But the family’s elation was short-lived. On October 10, 2015, Mason suffered a massive seizure and was rushed to Marshfield Children’s Hospital via flight for life. A CT scan revealed two large metastatic brain tumors. 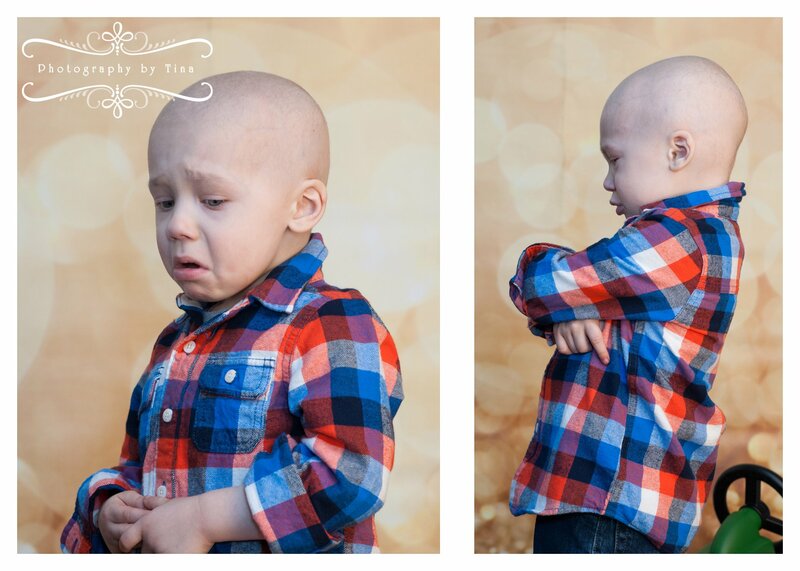 His neuroblastoma had relapsed. Daily radiation began immediately and a search began to find a surgeon capable of attempting to remove the two tumors. The Carpentiers found that surgeon in New York City, New York, and on December 7, they took up temporary residency in the Big Apple for Mason’s treatment. Regular scans and courses of radiation treatment have been ongoing to try to shrink the tumors small enough to perform the surgery. Mason is in good spirits and feeling well, and the entire family has been experiencing all that New York City has to offer as they await more news and the surgery. As of approximately a week ago, Mason’s medical team has scheduled surgery for Friday, December 18, to remove both tumors and place a catheter in his head for chemo. Stephanie says the doctors are anticipating a speedy recovery and can then decide on the next course of treatment to follow. 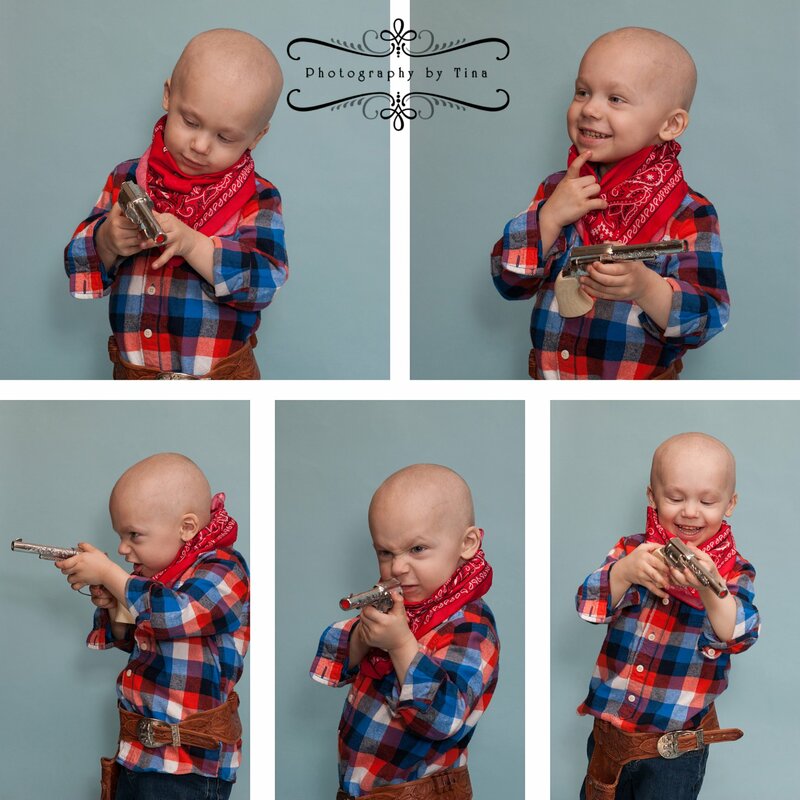 Despite all of the ups and downs, Mason, like many young children with cancer, has taken everything in stride. He is every bit your typical three-year-old boy! Stephanie and Joe, while coping with so much that no parent should ever have to deal with, are also remarkably resilient. In fact, the family is expecting a new arrival. Mason will get a new little brother in April 2016! There is also an account set up for Mason called Mason's Benefit at Merrill Federal Savings & Loan in Merrill, Wisconsin. “We really appreciate the continued thoughts and prayers!” Stephanie Carpentier says. Friends and family can get updates on Mason’s treatment and progress on Stephanie’s Facebook page. 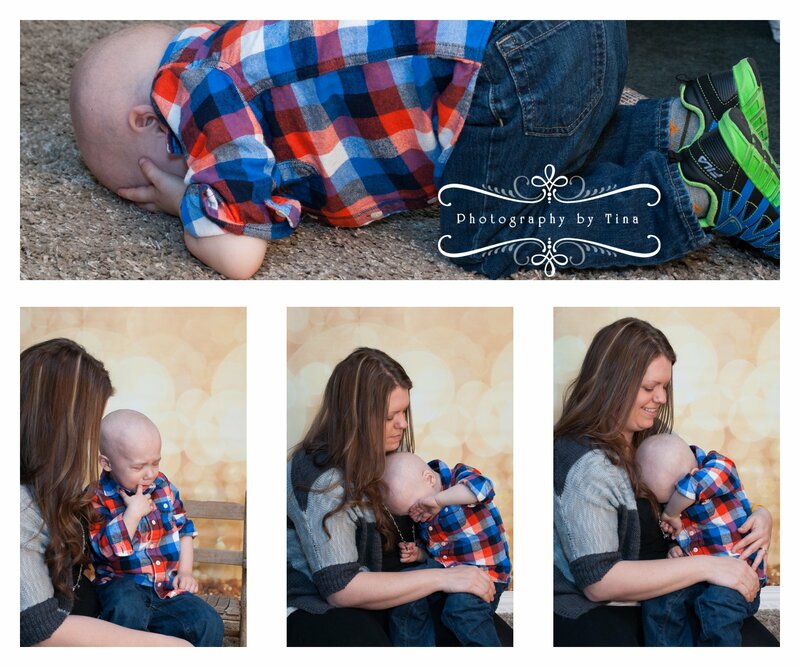 Thank you, Joe and Stephanie, for allowing me to create these special images of your amazing, strong, inspirational little boy! Stay strong, Mason! I’m praying for you!